Malcolm Turnbull has flatly turned down New Zealand’s offer to take 150 refugees from Manus Island. Immigration Minister Peter Dutton dismissed it as simply “a back-door way to get into Australia”, since New Zealand citizens don’t need a visa to migrate here. And this would violate the government’s insistence that the refugees will never set foot in Australia. New Zealand Prime Minister Jacinda Ardern has reiterated the offer saying, “we don’t think what’s happening there [on Manus] is acceptable”. She has even offered $2.7 million to restore essential services on Manus. In response Dutton threatened both New Zealand and PNG that any deal in the face of Australian opposition would have consequences for both countries’ relationship with Australia, warning they should, “think that through”. Ardern says she won’t proceed without Australian government support. And even if New Zealand was willing, PNG is even less likely to defy the Australian government. Publicly, both the Australian and PNG governments say that PNG is responsible for the refugees and asylum seekers there. But this is a fiction. Australia, the one-time colonial ruler of PNG, still exerts enormous control over the country. 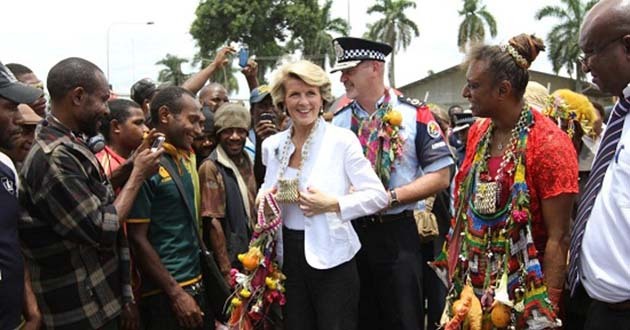 It bribed the PNG government in 2013 with $420 million in extra aid to agree to warehouse the refugees, outsourcing Australia’s human rights abuses. The Australian government has funded and controlled everything to do with the Manus refugees from day one. Even now it is paying for the construction of the new accommodation it wants to force the refugees into. Australian company Toll Group was paid $8.1 million to expand the capacity of the East Lorengau accommodation. Work building the West Lorengau Haus or Hillside Haus sites has cost the Australian government another $22 million. And it was the Australian government, not PNG, which negotiated with the US to resettle some of the Manus refugees—albeit a total of 54 people one year on. Australia is the superpower of the South Pacific. It is the world’s 14th largest economy, a third larger even than Indonesia with its 260 million people, the only other country in the region that comes close. Australia’s annual defence budget is around the same as almost all the other countries in the region combined (Indonesia, Thailand, Malaysia, Vietnam, the Philippines and New Zealand). Australia’s rulers have always sought to dominate the South Pacific as an imperialist power. PNG was run as an Australian colony until independence in 1975. This began when the territory of Papua was established in 1906, followed by the capture of New Guinea from Germany in 1914 during the First World War. Their main interest in PNG was keeping out rival military powers. This obsession continues, with last year’s Defence White Paper stating, “Australia cannot be secure if our immediate neighbourhood including Papua New Guinea, Timor-Leste and Pacific Island Countries becomes a source of threat to Australia”. Today the threat of rival influence comes mainly from China. PNG remains a poor country, with 75 per cent of the population reliant on subsistence agriculture. About 40 per cent, or three million people, live in absolute poverty. Australia did little to develop the country or prepare it for independence until the late 1960s. This has seen PNG remain reliant on Australia. The Australian government goes to considerable effort to maintain its influence. Australia sends more aid money to PNG than to any other country, and its annual $554.5 million contribution makes up three-quarters of the aid the country receives. Under the Defence Cooperation Program, Australia posts military personnel within the PNG defence force to train and support its operations, as well as supplying military hardware. The Australian government also pays for over 200 Australian staff to work as technical advisers within the public service. PNG has tried to increase its control over them, with Prime Minister Peter O’Neill telling parliament in 2015 they did not always serve PNG’s interests and ending the contracts of 15 Australian public servants. In February, ABC news revealed that Australia was spending $148 million to help PNG host the 2018 APEC summit. This includes extending the deployment in PNG of 73 Australian Federal Police officers. The decision was made because of fears, “any retreat would risk China filling the breach”. The Chinese government has invested $2.5 billion in PNG in recent years, and is building infrastructure including roads and airports. But this is still far behind the $20 billion in Australian investments particularly in mining but also banking and manufacturing. Australia also remains PNG’s biggest trade partner, although trade with China and Japan is increasingly important. PNG’s corrupt political leaders will keep letting Australia dump refugees on Manus as long as the flow of money continues. They are hardly in any position to refuse.